Every now and then, you read a book that resonates with your life experience and encourages you with a dose of hope and happy endings. 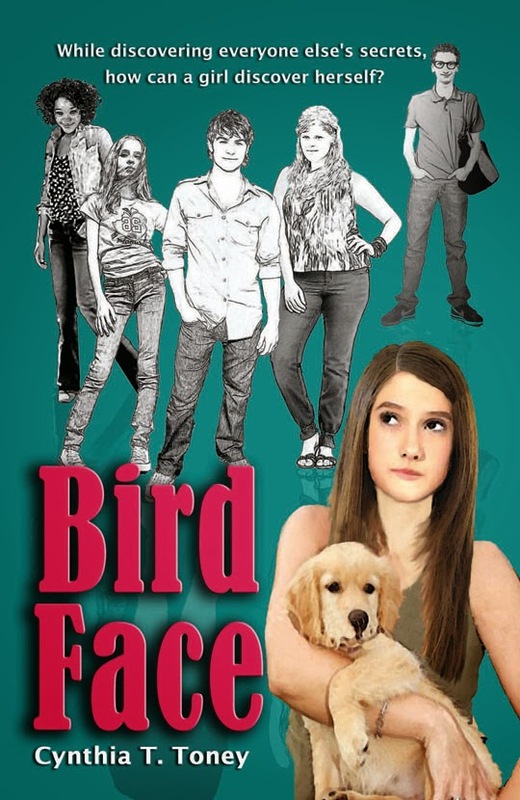 Bird Face, a young adult book written by Cynthia T. Toney is a treasure that provides an authentic look into teenage life through the eyes of the protagonist named Wendy. The author tells the story of this young girl who desperately wants to fit in, date her crush and escape the bullying she endures on almost a day-to-day basis. But Wendy is not without help—her best friend Jennifer who manages to be popular without being a Queen Bee or a Mean Girl, always stands up for Wendy and is quick to put the bullies in their place. A level of mystery is in this story through the leaving of sticky notes in Wendy’s school books and other places, notes that have positive words addressed to Wendy. It’s not until after the 7th note is found that Wendy discovers who the writer of these kind words is and to find out what happens next, you’ll have to read the book! Cynthia T. Toney does a delightful job of weaving hope and sunshine into what can be a cruel and dark time for many middle school girls and she does it with class, sass and fine taste. I recommend this book to every female, especially the target audience (teenage girls) because I believe they will be able to relate, will enjoy the read and will emerge inspired! Whew! We made it over the Christmas holiday! I know for some people that notable accomplishment deserves a victory dance. Christmastime can be a rush and you look forward all month to that one special day. You plan, coordinate and wish for all of your holiday dreams to come true. And then in just 24 hours that compose a date called December 25, it's over and you crash. Although we’re still within the Twelve Days of Christmas, the heady excitement of the Christmas holiday is over for most of us. I love Christmas, love the rush and excitement. However, there’s something to be said for the post-holiday Twelve Days of Christmas which ends with Epiphany, traditionally the day the Wise Men arrived at the holy manger. For me, the twelve days after Christmas are sort of a smooth landing after a wonderful flight. The rush is over, the wrapping paper has been ripped off the gifts and thrown away…and I have twelve days to bask in the deeper meaning of this holy event. Actually, I have an entire year to do that, but I’m a holiday and tradition oriented person. I do enjoy the traditional twelve days. This year my family has experienced great stress and anxiety within the last six months, upheaval even. We put up the small ceramic Christmas tree my late mother-in-law made instead of the usual seven-foot faux-fir we deck with an incredible amount of ornaments. This year a highly personal relationship with Jesus has never been so important to me. In John 4:12 the one who best loved Jesus tells us, “No one has seen God at any time, if we love one another, God abides in us, and His love is perfected in us.” [NASB] So, as things in my life manifest in ways I hadn’t planned, I find myself hugging up close to Jesus. I had quite an angry thought a few days back, actually several, one right after another. I had to say out loud, “No, I will not let this individual pull me out of love.” I had a few very difficult moments there, but with persistence and commitment, I was able to overcome my flesh and walk once again with the Lord. I do think saying the words out loud helped me. God used words. He spoke the world and all matter into existence. Speaking out loud about my commitment to a love walk, cut right through any drivel the enemy might’ve been throwing at me and I was able to overcome that challenge. In my contemporary detective novel, NYC female private investigator Veronica “Ronnie” Ingels travels to Texas where her cheating husband is murdered and she finds the handsome sheriff has her as a prime suspect. Ronnie struggles with faith but comes to admire the love walk of Bertha, her dear friend and humorous side-kick. I believe if there is anything I can take away from Christmas, it’s that my love walk can be a powerful witness of Christ in my life. I pray the Lord continues to walk with me, holding my hand and pulling me back onto the kindness and love path when I veer off. There is a saying by church folk that goes, "God is good all the time. All the time, God is GOOD!" Never before have I had that point proven in such a profound way as of today. Earlier today, I was going through a situation that was tough and I did not know what to do. But what did God do? Through my calendar notes a few hours later, He reminded me that I scheduled a devotional post for today. The devotional is written by a writer named Mary Hamilton and we scheduled it to be posted on my blog today (Dec. 29). Wouldn't you know, after arranging this post and reading the devotional by Mary, God spoke to me through the words He inspired Mary to write? And by that I mean, Mary's words in this devotional resonated with me in a profound way especially the point about feeling close to God on sunny days and then something happens that makes you feel like you've been left in the dark on your own because that's what happened to me literally a few hours earlier today. But I emerged (from reading this) encouraged along my life journey. So thank you Mary Hamilton for allowing God to use you through your written words to encourage my heart and remind me of this simple truth, God is good, ALL the time; ALL the time, GOD is GOOD! :) May you be encouraged by Mary's words too. Why is it so hard to remember and experience God’s love in the midst of trouble? So many times, I’ve been walking strong in my faith, enjoying close fellowship with the Lord. Convinced of His love for me, I revel in His presence surrounding me as I go through my day. Then, something happens—illness, a broken relationship, failed plans. Whatever it is, the enchanted spell shatters and I’m plunged into a dark abyss where I have trouble remembering all the aspects of faith I was so sure of only a few days before. I search for an awareness of God’s love and presence, but my circumstances make it seem like He’s left the building. How do we hold onto that certainty of God’s love when darkness threatens to overwhelm us? We remind ourselves of God’s character. What is character? It is the distinctive qualities that make up someone’s personality. It’s their reputation. My husband is known as an encourager, because he so often speaks words of encouragement to those around him. That’s his character. Someone who is not well acquainted with him might expect him to speak words of condemnation now and then, but anyone who knows him well has learned to expect only positive and encouraging speech. At times, he may choose to remain silent or there may be a conflict between him and another person, but that doesn’t change the way people expect my husband to act. They know his character, and are confident of his ways. John tells us God’s character is love (1 John 4:8). James reminds us His character never changes (James 1:17). In Deuteronomy, Moses declares God is faithful and keeps his covenant of love even to a thousand generations. Our perception may change, but God’s character remains the same. Knowing Him well brings confidence that even when He is silent, He is near and His love for us has not changed. If we want that assurance, we must study God’s character as revealed in His word and through His Son. We must know Him well enough to trust Him when our emotions and circumstances tempt us to think He is anything other than loving, faithful, and always present in our troubles. Mary L. Hamilton grew up at a youth camp in southern Wisconsin, much like the setting for her Rustic Knoll Bible Camp series. Hear No Evil and Speak No Evil are aimed at ages 10 and up. Each book features authentic male characters who come to summer camp with their own “baggage” from home. But they leave with a new perspective and a deeper understanding of their relationship to God. When she’s not writing, Mary enjoys knitting, reading and being outdoors. She and her husband make their home in Texas with a rescued Golden Retriever. It's Thursday and I'm thankful for Christmas blessings and monuments. No, not the National Monument located in Washington, D.C. but the monuments of life, moments where God intervened on my behalf, times where my faith in God has been strengthened through His answering my prayers in ways I'd least expect. I must give credit where credit is due, this whole "monuments" idea is inspired by a dear friend of mine named Emilie who during our conversation a few days ago, encouraged me to "set up monuments" and look back on it to remind myself of how God is providing for me. "That car God gave you," said Emilie. "Is a monument!" Earlier this month, God made a way for me to get a brand new car without being able to make a down payment. It was a very significant monument for me because for the past five months, my beautiful car that I loved was acting ugly. The door locks would repeatedly unlock every time that I pressed the "lock" button. It would happen morning, noon and night to the point where I was not comfortable driving my car anywhere because it made me feel unsafe. Now in the meantime, I'd taken my car to the dealership at least twice a month but their maintenance crew could not pinpoint the problem much less resolve it. And I did everything I knew as a Christian who believes in God should do during those five months of frustration, worry and doubt that God was hearing me. I even claimed the victory in the Name of Jesus (Christ my Lord)! But nothing worked, not even prayer. Or so I thought. Little did I know that God was working behind the scenes to remedy this situation and at the beginning of this month, He did. God made a way for me to trade in my old car for a brand new one and yes, I truly did not have to put any money down. My family emphasized the significance of that reality saying, "That NEVER happens! It's unheard of that somebody buys a new car without making a down payment." But with God, ALL things are possible! He can make ANYTHING happen and for this great monument, I am forever grateful. Not only am I grateful that God is faithful but I am encouraged. I will use this experience as a lesson point and that is when you're pushed against a wall (metaphorically speaking) and caught between a rock and a hard place (also metaphorically speaking) God has not forgotten you and He is perfectly capable of making a way for you out of no way. Only God can take a situation that appears to be hopeless to us and turn it around for our good, filling our hearts with His HOPE, our life with His LOVE and our minds with His PEACE. And that's exactly what God did for me this Christmas which leads me to my next point, Christmas blessings. God doesn't wait until Christmas to bless His faithful followers, I promise you. But I call this part of my post "Christmas blessings" because it happened at Christmastime. My brother was in a car accident on the beltway earlier this month. A car rear-ended his vehicle. Thank God he was not hurt but his car was totaled. Now the back story on this situation is that our parents had told him several times to buy a brand new car because his current one which was about 8 years old, was worn out and making noises that caused concern. But my brother refused to buy a new car because he did not want to pay a new car note. So what does God allow to happen? He allows my brother to be in a car accident that totaled his car which resulted in the insurance company sending him a check which in turn, resulted in my brother using that check to make a down payment on a brand new car that he loves even better than his first vehicle! In closing, I'd like to encourage you in the words of my friend Emilie, to make monuments and when times get tough or your faith falters, return to those monuments in your mind and remember how God provided for you in the past. It's like that song "Same God" by Tye Tribbett that says, "If He (God) did it before, He (God) can do it again!" So don't give up or give in. Trust God to turn it around for you. God is AWESOME and He knows exactly how to help you. Best part? He never changes so His promises are good for eternity. Clearly, if God provided for you in the past, He will provide for you in the present. Trust Him with your life. He loves you and will watch out for you! God has your back, not just today and tomorrow but forever. GOD is forever Faithful! :) Read 1 Corinthians 1:9. Allow your mind to marinate on those words. Christmas Eve is today which means Christmas Day is tomorrow, at least here in the United States of America. But if you live in Australia or Asia, you are already celebrating Christmas Day because where you live the date is Dec. 25, 2014. Isn't it amazing how one side of the world is living in today and the other side is already witnessing tomorrow? What's even more amazing is the story of Jesus Christ. He came into this world in the form of a baby to give us life. Not only to teach us how to live every day life for God but to show us the way to heaven so that at the end of humankind's story here on Earth, we can have a chance at eternal life. What better way to celebrate the holiday season than to remember the reason for the season (Jesus Christ)? Today, I invite you to read a devotional written by Katheryn Maddox Haddad, a woman with a heart for sharing the gospel of Jesus Christ. The adjustments Jesus had to make for us. They were infinite. He gave up his spirit body that could be everywhere in the cosmos at once, to be confined in a human body that could only touch, see, and hear a few feet in any direction. He gave up his throne for an animal’s feed trough. He could have at least been born in the holy temple. But that was not enough. He had to give up everything. He gave up glory for swaddling bands. He could have brought with him a halo; he preferred to become, in every way, one of us. He gave up the admiration of angels for no one even noticing his birth except for dirty, smelly shepherds. They couldn’t even stay very long to worship him. He gave up streets of gold for streets sometimes littered with putrid garbage. He gave up the protective love of his Father to be chased by an evil king until his parents had to flee their own country to protect him. He gave up the tree of life so he could wander the hills without even a place to lay his head so he could give people his bread of life. He gave up most of his powers most of the time so he wouldn’t make us feel too inferior. He could have called lightning down on sinners. He held his powers back and only used them to prove who he was ~ the Prince of Peace. He gave up angel songs for weeping. He gave up tranquility to be tortured on a cross. How easily he could have willed himself down from it. He knew he had been born to die. He had never been born before. He had never died before. It was only by doing both that he could overcome death for us, and give us new birth. All this he did for his enemies, sinners of the world ~ all of us. It is beyond our comprehension to fathom what he gave up. It is beyond our grasp to understand. God put his words in a human body for awhile so he could walk the earth with us. Such love. We are awed. Katheryn Maddox Haddad grew up in the north and now lives in Arizona where there is no snow. She lives with her palm trees, cacti, music, and a computer with most of the letters worn off. 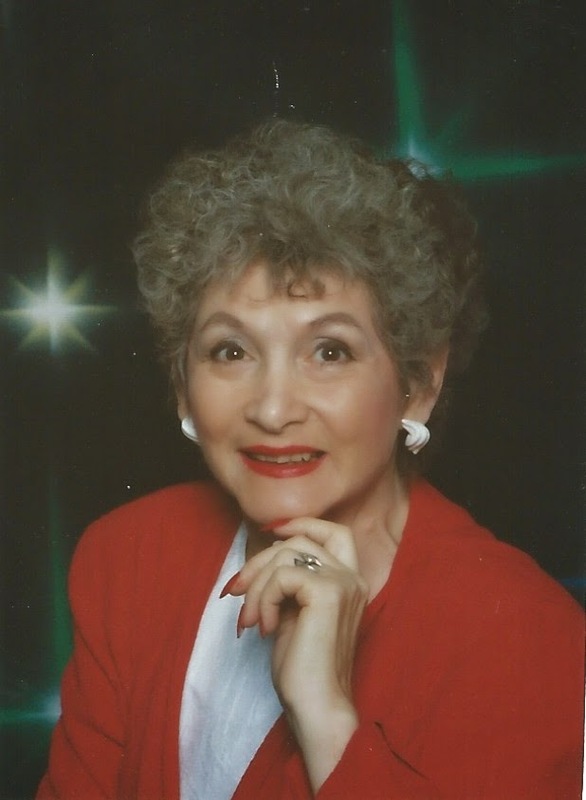 Her newspaper column appeared for several years in newspapers in Texas and North Carolina ~ Little Known Facts About the Bible ~ and she has written for numerous Christian publications. For several years, she has been sending out every morning a daily scripture and short inspirational thought to some 10,000 people around the world. She spends half her day writing, and the other half teaching English over the internet worldwide using the Bible as text book. She has taught some 5000 Muslims through World English Institute. Students she has converted to Christianity are in hiding in Afghanistan, Iran, Iraq, Yemen, Uzbekestan, and Palestine. “They are my heroes,” she declares. 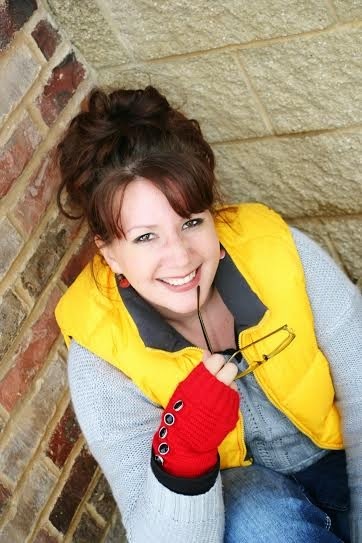 Katheryn is a member of Christian Writers of the West and American Christian Fiction Writers, and is also an energetic public speaker who can touch the heart of audiences. 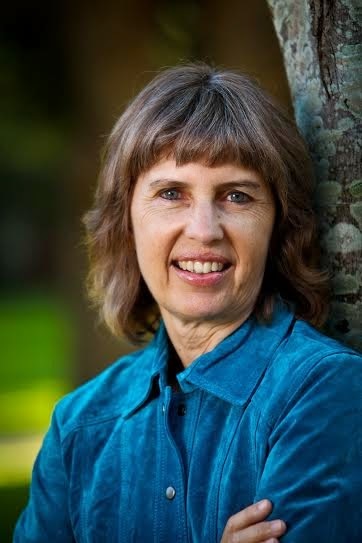 Her books include Applied Christianity, Inside the Hearts of Bible Women, The Holy Spirit in 365 Scriptures, Revelation: A Love Letter From God, Worship Changes Since the First Century, Worship the First-Century Way, The Best of Alexander Campbell’s Millennial Harbinger, and Christianity or Islam: The Contrast. Her Inspirations Under the Thinking Tree is a series of short reads on numerous thoughtful topics. She has also written two books on genealogy. It's beginning to look a lot like Christmas! Only two days away! What better way to celebrate the holiday than by reading a Christmas novel? Better yet, how about reading that holiday story without having to buy the book? My featured author for today, Trish Perry, agreed to give a copy of her book Love Finds You on Christmas Morning, to the winner of the book giveaway contest we're hosting here on my blog! The contest starts right now and will end Wednesday, Jan. 7, 2015. You can enter the contest by answering Trish's question for my readers at the end of this author interview blog post. You are required to leave your e-mail address in your comment in order to qualify to win the book. We need your e-mail address so Trish can contact you and make arrangements for you to receive your prize. The winner will be announced here (my blog) on Thursday, Jan. 8. Alexis: Love Finds You on Christmas Morning is a beautiful story title. Tell me about your holiday book. Is it a novel or novella? Trish: It’s two novellas in one book. Debby Mayne’s historical story Deck the Halls, is set in Cary, North Carolina in 1925. My contemporary story, ‘Tis the Season, follows. It’s set in the very same town several generations later. Debby’s hero and heroine are my heroine’s great grandparents. Debby and I have become good friends through the years and we worked together on another project, a book of devotions, before Christmas Morning. We’re a no-drama pair of writers—that is, we like to keep the drama on the page. Debby’s a great idea gal, so she probably came up with the idea of Christmas Morning too, if I remember correctly. She had written for the Love Finds You line previously, so I was blessed when she asked if I was interested in collaborating. I think we’ll do it again in the future. Did you like working with Debby on this holiday book? Why or why not? I love working with Debby. She’s fair, open-minded, and fun. And she’s disciplined, which is fantastic in a collaborator. You don’t have to worry she won’t make a deadline. Quite the opposite. If we lived closer to each other, we’d hang out. And I’d be happy to work with Debby on future projects. Is Love Finds You on Christmas Morning your first holiday story? Yes, this was my first holiday story. I have a few others in mind and I hope to work on those at some point when I’m not quite so busy in my day job. Who is your favorite character in Love Finds You on Christmas Morning? Explain why. I really love Harvey Fennicle, the eccentric, elderly billionaire for whom my young heroine Nikki is a personal chef. He has a dear heart. Despite his wealth and busy life, he cares about his family and his small band of personal employees. If you could spend Christmas Day with one of the characters from your book, who would it be? Why? Certainly, I’d enjoy Nikki’s company, even though I’m far older than she is. I love the fact that she’s driven to regain a piece of her family history. I think many of us have fond memories of our childhood years and the homes in which we spent them (especially our Christmases). The fact that Nikki cares about her nostalgic memories as much as she does is endearing and interesting to me. And isn’t nostalgia one of the best by-products of Christmas gatherings? Where did you get the inspiration for these characters? Debby and I brainstormed a bit and once I had a good feel for Debby’s storyline and main characters, I knew which future family member I wanted to create and focus on. I had the advantage of having some of my heroine’s backstory told while Debby’s story unfolded. So I knew some of the qualities she inherited. Describe your writing space. Do you have a special writing ritual? If yes, please explain. When I moved into my townhouse several years ago, I set up a writing desk in the reading area of the master bedroom. But I set up my computer desk on the main floor, right next to the kitchen. That’s where I ended up setting up shop. It’s warmer, has more light, and is convenient to both the kitchen and the breakfast nook so I don’t need to truly stop working when I take breaks. When I’m under contract, I usually work out how many words I need to write each day—assuming breaks for vacations and commitments to family and doctors and such—in order to meet my deadline. I’ve found I definitely do not have time to write on the days I work my day job, so I write on my days off. I start the day going through emails and tending to any business necessary. Then I start writing. Although I fit breakfast and lunch in between bouts of writing, I don’t allow myself to break for the evening (and dinner) until I’ve reached my word count. It keeps me driven! What’s your favorite Christmas book? Why? I have to say, I still remember sitting in the tub, crying while reading The Christmas Shoes, by Donna VanLiere. I read the novel before the song was written, using the same story, but it was fairly clear where the story was heading. Still, when the most poignant scene in the book hit me (you’ll get no spoilers from me!) I was a wreck. I recommend it as a lovely Christmas read. What are you hoping your readers will remember the most about Love Finds You on Christmas Morning? I hope the importance of family will impress readers. That importance isn’t news, of course, but we all need the reminder from time to time. And I hope they’ll just have an enjoyable experience. This book won’t make anyone cry, but I do think it will make people smile. Did your real-life personal love story happen at Christmastime like it did for the characters in your book? If so, please share details. Christmas does lend a lot of romantic atmosphere to our lives, doesn’t it? I’m no longer married, but we did get engaged during the Christmas season. I chuckle remembering the moment, because my husband wasn’t the most romantic guy in the world. He pulled me into the bathroom at his house in order to have privacy when he proposed. Not exactly skywriting or proposing a la flash mob. But it was a charming proposal, nevertheless. Complete this sentence: At the end of this holiday season, I will ________________. At the end of this holiday season, I will spend as much time as possible with my adult son. He’s moving to the other side of the country in January and I’m going to feel his absence in a very strong way! Alexis: Thanks for the interview, Trish! Is there a question you’d like to ask my readers? Yes! When I reach the point that I can cut back on my work hours and write more steadily again, I plan to work with Christian publishing houses, but I may also join many of my fellow traditionally published novelists and do a bit of independent self-publishing (e-books, mostly). I’d like to know if readers are currently reading any such books written by Christian authors. Trish's question for my readers to answer: Do you feel comfortable buying self-published books by proven authors, or do you still need that traditional publishing house stamp of approval on every book you buy? 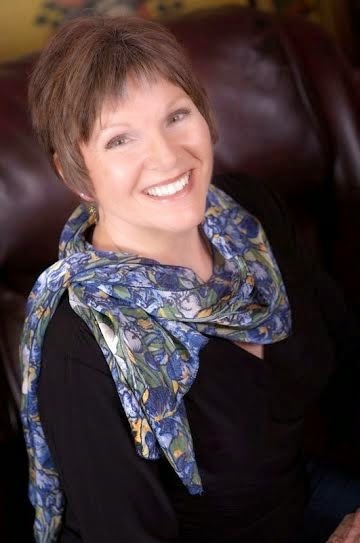 Award-winning novelist Trish Perry has written The Midwife’s Legacy (Barbour Publishing, 2012) with three fellow authors, as well as Tea for Two (2011), The Perfect Blend (2010), Sunset Beach (2009), Beach Dreams (2008), Too Good to Be True (2007), and The Guy I’m Not Dating (2006) for Harvest House Publishers. Perry's 2011 releases for Summerside Press are Unforgettable, Love Finds You on Christmas Morning (with Debby Mayne), and two devotionals, including Delight Yourself in the Lord (Even on Bad Hair Days), with four other notable authors. Her monthly column, “Real Life is Stranger,” appeared in Christian Fiction Online Magazine during its inaugural year. She was editor of Ink and the Spirit, the newsletter of Washington D.C.’s Capital Christian Writers organization (CCW), for seven years. Before her novels, Perry published numerous short stories, essays, devotionals, and poetry in Christian and general market media. Christmas is coming! Only three days away! Yet over 2,000 years ago, the first Christmas was celebrated on a starry, starry night in Bethlehem where the virgin Mary laid her sweet baby Jesus in a manger filled with hay. Yes, the Savior of the World, Jesus Christ was born through a virgin named Mary who was engaged to a man named Joseph. Mary and Joseph were poor in finances but rich in their relationship with God. They had faith more valuable than gold. It was their faith that kept them together when the angel of God told Mary that she would give birth to the Savior of the World and no this was not her fiance Joseph's biological child. However the process was pure and beyond our imagination. The Bible does not go into detail about how God sent His Son to Earth in the form of a baby carried in Mary's womb and delivered on that starry night in a stable filled with hay. But the Bible is clear on this, with God all things are possible (Philippians 4:13) and as the song by Brooklyn Tabernacle Choir on their Christmas CD says, it was the "birthday of a King!" What better reason to celebrate this Christmas season than to remember when this holiday was first created? And to hold on to the hope that no matter how crazy life in this world gets, God is still in control. If God can send His Son to be born, raised, minister to the sick and lost, then die and be resurrected to encourage His faithful followers and be humankind's High Priest and Mediator before God in Heaven (all of which completed the work of salvation) and then in turn He offers salvation to us as a free gift then of course God can keep you, bless you and deliver you from any trial and tribulation you may be facing! But back to Mary as the Mother of Jesus. Mary was a very special woman. Despite her elevation of being the most favored woman of God and her willingness to be used by Him in His great plan to save the world, Mary was humble. She did not go around boasting and bragging that she was going to carry the Creator of all humankind in her womb and give birth to the long-awaited Messiah. And I'm sure she didn't try to one-up other mothers that she knew when talking about her child Jesus Christ. I mean seriously there's no greater title than your boy child being the Son of the Eternal King, right? Sure, doctor or lawyer, King of a Middle Eastern country or the President of the United States of America may be impressive titles but clearly God created all of those people who hold those titles yet He chose to collaborate with Mary to create His Son in human form. Yeah, Mary had plenty to boast about but she didn't. Mary did not boast. She stayed humble and faithful to God and she pondered this special mission God had given her in her heart (Luke 2:19). There’s a popular Christmas song, “Mary, Did You Know?” I’ve always wondered what she knew, when she held Jesus in her arms, his dark eyes squinting in new birth and his tiny voice straining to make sure the world He had arrived. Did she know? All Scripture tells us is that she pondered it all in her heart. I never understood that. Until Christmas 2009. My daughter was early. Too early. Although in many experiences, three weeks isn’t that unusual. In my daughter’s, she just wasn’t ready. To be born. To breathe. To cry. How can a mother forget the croaking whimpers of a newborn with not enough air? The croons of Daddy coaxing, “breathe, Baby Girl, breathe”. Labor. Pains. Vomiting. Exhaustion. And now … impending death. Mary looked at her boy. Newborn. His velvety hair, olive skin, wrinkled and innocent. A purity he would never lose. And eyes that were sharp, knowing. Mary pondered … impending death. The room was a bustle of activity. My daughter was whisked away and then brought back to my room to be held on my chest for thirty seconds so she could bond with her mother’s scent. Then they wheeled her away to an ambulance. And I screamed. I limped into the NICU. The incubator was warm, soft light glowed. Her Daddy had been there four hours before I arrived. The nurse told me he had not moved. And in the warm glow, I saw it. My daughter’s finger, squeezing her Daddy’s finger, white-knuckled grip with no intention to let go. Daddy was her salvation. And Mary squeezed His finger, with no intention of letting go. But she would have to let go. He was her Abba, her daddy, her Father. For He was her Savior. It was a dichotomy. And Mary pondered … A Savior. A King. Her Son. Her baby would save the world. Of course she didn’t know. She didn’t want to know. But she had this moment. A mother’s arms, full, in love, and a deep breath that her son, was God’s son. A gift she had been given that she would never regret. Jesus. Professional coffee drinker Jaime Wright resides in the hills of Wisconsin writing spirited and gritty turn-of-the-century romance stained with suspense. Her day job finds her a Director of Associate Sales, Development & Relations. She’s wife to a rock climbing, bow-hunting youth pastor, mom to a coffee-drinking little girl and a Sippy cup-drinking baby boy, and completes her persona by being an admitted Facebook, Twitter, Pinterest, and Blogspot junkie. 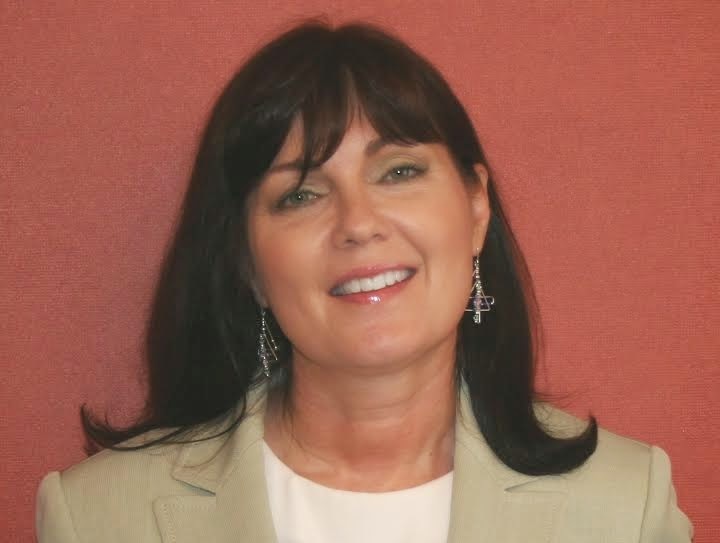 Jaime is a member of ACFW, enjoys mentorship from a best-selling author, and has the best critique partners EVER! (Yes, that's an exclamation point.) She was a semifinalist in ACFW’s 2013 Genesis contest and that alone encouraged excessive celebration over extra espresso with hazelnut syrup. In her "down time", Jaime reads voraciously, socializes incessantly, drinks coffee addictively, and overuses "-ly" words excessively. All of the above and more is what people are saying about Sally Bradley's debut book, Kept. 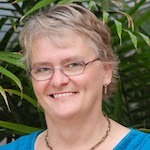 Today, I am happy to host this new author and experienced freelance editor on my blog! But first a little back story: I know firsthand the value and expertise of Sally Bradley as a freelance fiction editor because she edited my first book! Hope in My Heart: A Collection of Heartwarming Stories would not have been the same stellar story if it was not for Sally's substantive/content edit which made me take a second look at my work and fine tune it to make it shine. So I am especially grateful for Sally's talent and keen eye for improving stories while not losing the author's creative voice and I am not at all surprised that Sally's first book Kept is already on the fast track to becoming a best seller. Alexis: Your book Kept is a keeper, a beautifully woven story of redemption, God’s grace and His perfect love. Why did you write this novel? Sally: Thanks for the kind words, Alexis! I’d been meeting more and more women who’d come out of partying, promiscuous pasts and become Christians. Some of them still struggled with guilt over what they’d done. All of them dealt with keeping the details a secret because if people at church found out... what would happen? How would their friends look at them? How would people perceive them? Treat them? I wanted to show that regardless of their pasts, God loves them the same as the “good” Christians, the ones who don’t have those pasts or have just done a fabulous job of hiding it. And I wanted to open up this line of thinking to those who haven’t come from that background, to get them thinking about how they’d react to someone who’s lived that way but is now following God, someone who’s just as forgiven and loved as they are. Kept is quite a thick novel with 422 pages! Did you ever grow weary during your story writing process? What “kept” you inspired and motivated to finish this novel? I really didn’t. I loved the story from day one and wanted to spend every second I could with Miska and Dillan. Believe it or not, the original draft was much longer, and I ended up cutting sixty-thousand words. I don’t know how many pages that is, but that’s basically a short novel itself. The main character in Kept is a woman named Miska who works as a freelance editor. Since you work as a freelance editor in real life, was it easier writing Miska's story and making her work believable because you have experience in that industry? Her work history is different than mine. I’d say she actually has more experience editing than I do. But I needed a job where she could work from her home. And having her love words and wanting to write herself made a couple of the other subplots fit perfectly. So it was an idea that occurred very early with the character and allowed everything else in the story to click seamlessly into place. As far as making it believable, it did help having a behind-the-scenes take on the publishing world. At one point Miska says something about going back to work in-house for a publisher and how it doesn’t appeal to her like it used to because now she knows what it’s really like. All the meetings and such... I remember being stunned at how many meetings there were. There are constantly meetings—weekly, monthly meetings on the calendar as well as impromptu ones that pop up. I wondered how certain departments got anything done! You’ve said in previous interviews that you modeled Miska after a "more natural" Kim Kardashian West. Why was the famous socialite your inspiration for this character? Actually it was more the opposite. I got the idea for the story back in the beginning of 2007, and I had no idea who the Kardashians were then. But I knew immediately what Miska looked like. She would be gorgeous, of course, but she wouldn’t have that innocent, girl-next-door look. She’d have a more exotic, pin-up look. And when I saw a picture of Kim K. almost two years later (yes, I was late to knowing who they were! ), it was almost like looking at a picture of Miska. Almost because Miska has naturally curly hair. So I always phrase it by saying that Kim looks a lot like Miska, not the other way around. And nothing about Kim herself had anything to do with Miska’s character. They look alike; that’s all. Their personal lives are completely different. Miska has a blog about being a “kept” woman. What does that mean? Basically she’s the mistress of a professional baseball player, a “kept” woman because Mark, the baseball player, always gives her gifts that help her stay in her dream home. He’s told her he’s leaving his wife for her, but she finds out in that first chapter that he might have been stringing her along all this time. Since Miska’s a writer who edits, she often doesn’t have the energy or brain cells to write something of her own; all her writing energy goes to her clients. And she’s struggling to stay in her dream home so she’s working tons of editing hours. But the need to write is strong. So she decides to start writing about the one thing she knows that’s unique to her—and that’s being a kept woman. She doesn’t want to put her name on it—and Mark wouldn’t want her to either—so she blogs anonymously whenever she can, when ideas strike, that sort of thing. It’s just a way to satisfy her craving for story and words. You went indie with your first book (Kept). Describe what “indie” means. What are the unique challenges and benefits of being an indie author? Indie just means that I published it myself. Some might use the term self-published, but that has a negative connotation from before the e-book era. I just hired out everything a publisher would do that I couldn’t. So I hired a cover designer, an editor, and a formatter. The rest—the numbers side of things, the marketing, etc.—that’s all on me. So I take all the risk, but I get all the reward too. And so far I’m really pleased with the experience. I plan to keep going this route. Do you want to be traditionally published with an agent, book deal and the works? Why or why not? I haven’t ruled out traditional publishing, but my take on it has changed. The traditional route has a lot of value, but the author gives up a ton for that. Really indie publishing has a lot to say for itself, a lot that’s making more and more traditionally published authors take a second look. What advice do you have for aspiring authors who want to write a book that’s receiving such remarkable reviews and winning awards like yours? Take risks. Writing a salable book that agents and publishers say they’re looking for is just fitting in with the crowd. If you want to stand out, you have to write the book you’re passionate about and let it take you where it wants to go. This might mean that the traditional route won’t touch it. That’s what happened to me. I was a complete unknown with a small platform and too much risk. But if you can publish that book yourself and build a readership (which, let’s be honest, is impossible to do without a book to sell! ), you can interest publishers that way. I think you just write what’s on your heart, what God’s led you to write, and be honest about it. You might say, Go big or go home. I knew Kept was a risky story to try to sell; I just didn’t realize how risky. But in the end, it’s all worked out. So the risk was well worth it. And it should go without saying, but... Grow as a writer. Read a ton; write a ton. Always be learning. And don’t publish too soon. Don’t be satisfied until your stuff reads like good novels in bookstores. 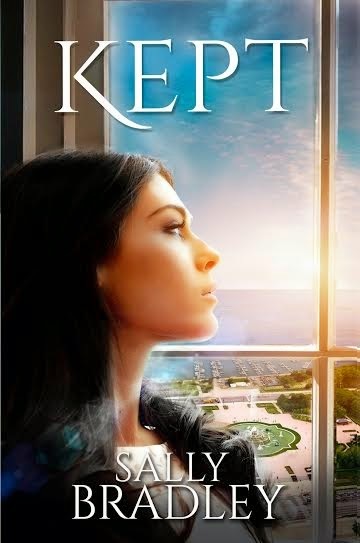 What are you hoping your readers will remember most about Kept? That when we come to God on His terms, He’ll put our sins behind us, that we can then have a true, loving, deep relationship with Him. Do you plan on writing more books? Are you working on your next one now? If so, please share details. I’m thinking through a sequel to Kept. It’s not ready to write now but maybe in a year or two. Right now I’m working on a book called Shelf Life. The tagline is, “What’s the shelf life of a trophy wife?” It’s about a woman who’s become a Christian after a traumatic event. Being a Christian has healed so much of her life—except her marriage. Her husband, an out-of-work baseball closer, doesn’t believe in God, so her new faith is tearing their marriage apart. I wanted to explore how women handle a relationship when they each have such different worldviews. What is the name of your favorite author and which one of their books resonates with you the most? Why? I love Francine Rivers. She became a Christian in the late eighties/early nineties, and it’s her books from that point on that I enjoy. She deals with real issues and goes deep, all the while maintaining an honest yet Biblical worldview. My favorites of hers are A Voice in the Wind, The Scarlet Thread, and The Last Sin Eater. I think The Scarlet Thread would be my favorite. Alexis: Complete this sentence: My favorite feature about being a published author is _____________because____________. Sally: My favorite feature about being a published author is making up stories for a living because my mind is just wired that way! Every once in a while, you'll read a book that resonates with you. It's a book so good that you simply have to share it! Family Christian Bookstore's blogger program sent a copy of Stasi Eldredge's book Becoming Myself: Embracing God's Dream of You, to me for an honest review. After reading it, I found that it is one of "those" books that is SO good that you have to share it! “It’s good to dream. We can’t out-give God. We can’t out-love him, and we can’t out-dream him. Give yourself permission to dream big! Dream deep. Dream wide. Because the thing about dreams is, dreams come true.”~Stasi Eldredge, “From Accepting to Embracing” (Ch. 6, page 101). It is good to know that there is a God and He encourages us to dream. 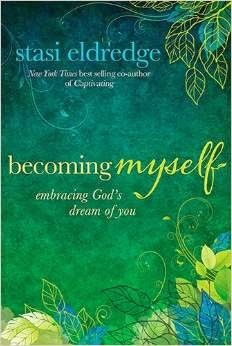 Such is the theme of Stasi Eldredge’s book, Becoming Myself: Embracing God’s Dream of You. In the 250 pages of Eldredge’s book, she bares her soul through the intimate storytelling of childhood memories and adult experience. The author shares stories from her life. Stories of searching for beauty, enduring drama, experiencing trauma and healing from pain. Eldredge does not hold back on giving in-depth illustrations about the lessons she’s learned along her life journey. The first pages of the books are filled with a personal story that involves Eldredge’s mother-in-law, body image and a free massage at the spa. The author explains her anxiety about allowing someone to see what she thinks is her imperfect body, even if it’s just for the purposes of a relaxing massage. The scenario becomes embarrassing for Eldredge because of various obstacles she faces when she arrives at the spa such as barely being able to cover herself with the bathrobe provided by the spa, the same complimentary robe that fit the other women perfectly. As a woman and writer, I think Eldredge does a good job of setting the stage for the rest of her book—an honest portrayal of how we as women see ourselves and a wonderful lesson of why it is important to ask God to help us to realize our true value and worth because we are all beautiful in God’s eyes. My favorite part in the book was the chapter “From Accepting to Embracing” in which the author spoke in-depth about the value of dreams and trusting God with the outcome in life. Eldredge’s story resonated with me as a female who’s struggled with self-image and realizing my true worth in God’s eyes. I found hope and encouragement in the pages of this book. The only aspect of this book that I think could use improvement is the structure and flow of the storytelling because at times it seemed like too much information at once and there is a need for better transitions from story to story within each chapter. I think there are a few sections in Eldredge’s book that would be even more powerful if the words were arranged in a more precise and concise manner. However, it does not take anything away from Eldredge’s skill as a writer and her honest portrayal of her life journey as a woman seeking perfection in a world that is not perfect. Ultimately, I believe the author accomplished her objectives in telling this story and inspiring women who get lost in these pages of Eldredge’s book to discover God’s dream for them and realize that they are enough, they are more than enough in God’s eyes. The author did a beautiful job of encouraging my heart and helping me to remember that my value is within what God thinks of me and knows to be true, not the lies the negative forces in this world will tell me to believe. Therefore, I recommend this book to every woman, especially young women, as a source of real-life encouragement for your life journey. I believe this book deserves a rating of four-stars. 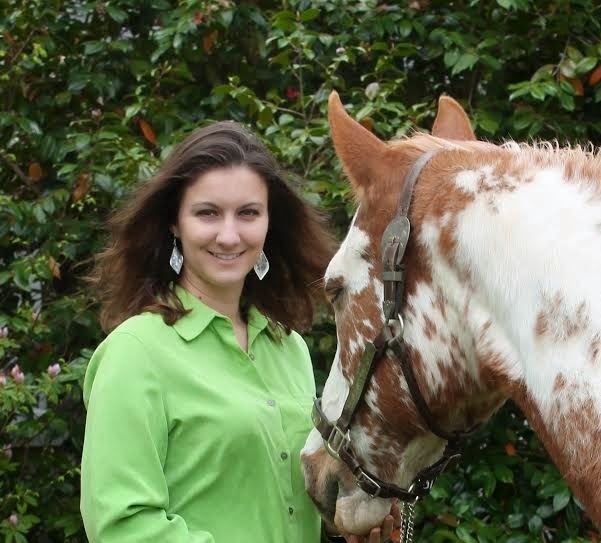 Visit Stasi's official website for more info on "becoming myself"
Today, I am delighted to introduce you to a writer who describes herself as a "Southern Country Belle," loves the slower pace, appreciates the beauty of living in the South so much that many of her fictional stories happen on ranches and involve horses. 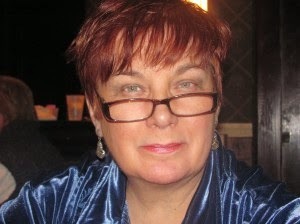 Misty M. Beller is this sweet writer's name and she has agreed to be hosted here on my blog today. 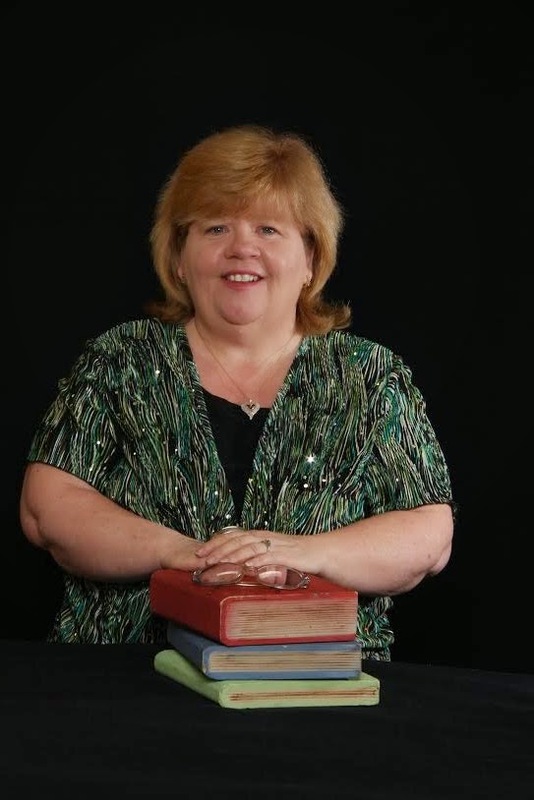 Alexis: Why do you write historical romance novels for the Christian book industry? Misty: I tend to be a bit of a sentimentalist, so Historical Romance is perfect for me! My favorite period is between 1860 - 1880, when the cowboy days were really ramping up. I love the simpler life, where there's no rat race. Just hard work, plenty of alone time (can you tell I'm an introvert? ), and a strong family unit. God is the central element in my life, so I want my books to naturally reflect him. When did you first know that you wanted to be a writer? Share the story. All my life, I've been a true book lover. Give me a good novel, and you probably won't see me again until it's finished. I've also always enjoyed writing, and tend to express myself best through my written correspondence. In high school, I had a poem published in a commercial poetry compilation book. But I never seriously thought about writing a novel, until about four years ago when I put together my bucket list. "Write a novel that's published" made it near the top! I decided, it's now or never, and made the commitment to do it. So, I had a general idea that I wanted it to be a Christian western romance. But where to start? I finally decided I needed to find a good book to help me plan. I stumbled upon (a.k.a. God led me to) the best possible book to help me get started with a great plan: Plot and Structure by James Scott Bell. For all you writers out there, I can't recommend it highly enough! From there, I've soaked in every bit of writing instruction I can from some amazing groups and individuals. And I've spent countless hours sitting with my laptop pouring out words onto the screen. The Lady and the Mountain Man is my first release, but the second novel I wrote. My first novel is under contract with Prism Book Group to release in 2015. Writing is in my blood. It's my passion. A true gift from my Heavenly Father, and I pray daily that he uses the words for His purpose. I've written in a few coffee shops, on the beach, and around a campfire in the mountains, but most of my writing spots aren't nearly as romantic. I write on a laptop, so I'm usually sitting Indian-style with my laptop on either my bed or the living room couch. One of the most important things for me is NO DISTRACTIONS. It's almost impossible for me to write with my husband or daughters around. Just too hard to get lost in the words. Do you write full-time or do you have a day job? Please explain how you make ends meet. Alas, I'm not one of the lucky full-timers yet… (dramatic sigh) Kidding aside, I do enjoy my day job, but between that and my family, writing time is precious! What would you say is the most challenging aspect of being an author? Keeping up with it all. Between word counts and deadlines and critique partners and marketing efforts, there are so many balls to juggle! What is the most rewarding part of being an author? Honestly, hearing from readers. Whether it's a review on Amazon, or a note through my website, it makes my week to hear from a reader they've enjoyed my story. How many books have you written? Are they all for the Christian market? Why or why not? I'm just finishing up my fourth book right now, the sequel to The Rancher Takes a Cook that will release from Prism Book Group in June 2015. I love reading and writing Christian romantic fiction, because it provides a place where we don’t have to always be concerned about inappropriate language or too-graphic love scenes. It’s a “safe zone” where our imaginations and emotions can run wild and free, living out exciting times and experiencing God-orchestrated happily-ever-afters – without having to clean-up at the end of the day. As a writer, who or what has been your most valuable resource? Please explain. Wow, I've learned from so many amazing people, books, etc. If I had to name a single resource, it would have to be the organization American Christian Fiction Writers. The wealthy of learning opportunities, connections, and support is amazing! As a woman of faith, how does your relationship with God affect your writing? Oh, yes. Through the years, it's been abundantly clear to me that the words I type onto the blank page are God's words. I try to pray before I begin each writing session, and I earnestly seek God's direction for each story. Wow, that question looks so simple but runs so deep! I love stories. I love immersing myself in another world, seeing life through the eyes of another person. It can be a powerful experience. Who is your favorite author and which one of their books do you love the most? Explain why. Hmmm… So many great authors, it's hard to choose! One of my favorites is Karen Witemeyer, especially her book Short-Straw Bride. It's such a fun historical romance, and Karen's use of word pictures is exceptional. You grew up in South Carolina. Would you describe yourself as a Southern Belle? Why or why not? Yes, I guess I have a bit of the old-fashioned type of Southern Belle in me. I may be more of a Southern Country Belle. I love the beautiful charm of the South, the slower pace, and the kindness in the people. Not to mention sweet iced tea. Explain your love for the simpler farm life. How does your love for farm life translate to your characters, or does it? My stories also take place around horses and ranching, which comes from my love for those animals. I was completely horse crazy growing up, and actually trained and showed horses professionally for a couple years after high school. Would you say your family has always been supportive about your writing career dreams? Explain. Yes, my husband is usually very patient with my many hours spent writing. My parents and grandparents are my biggest supporters, always asking for updates and cheering me on. What is your favorite feature of this holiday season? Our traditions. We live close to both sides of our family, so we are able to enjoy so many rich traditions with both my family and my husband's. It's such a special time of doing things together that bring back wonderful memories. Every writer has a muse. Who or what is yours? Hmmm… I haven't thought about that question before. My inspiration is often spurred by alone time. Sometimes reading another good book. Complete this sentence: At the end of the day, I am _____________________because _____________________. At the end of the day, I am thankful because God has me in His will, wherever that might take me. 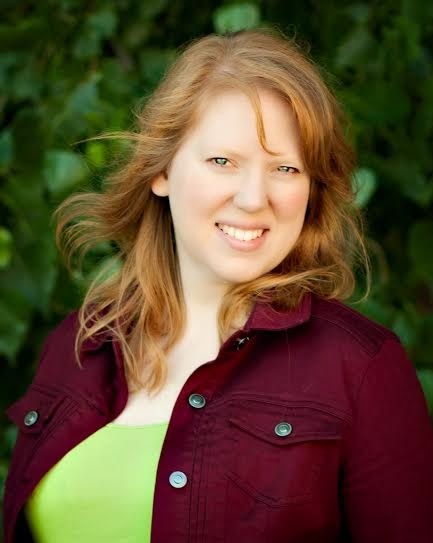 Misty Beller writes Christian historical romance, and is the author of The Lady and the Mountain Man. She was raised on a farm in South Carolina, so her Southern roots run deep. Growing up, her family was close, and they continue to keep that priority today. Her husband and two daughters now add another dimension to her life, keeping her both grounded and crazy. Read more about Misty at her website, and check out her book, The Lady and the Mountain Man. My sister and I have an affinity for cardinals. Whenever I hear the recognizable cardinal’s song, I smile as though God is greeting me through that bird. My sister loves cardinals so much she even recorded one singing for her time in Arizona where cardinals are not native. I like to imagine what the red bird is saying: “I’m here, here, here”; the higher “find me, find me, find me”; or the lower whistle sounds to me like a repeated “cheery, cheery, cheery.” I’m sure the birds are happy because God gives them a joyful song to greet the day (and lift human hearts). My sister claims no two cardinals sound alike. I stop what I’m doing to lift my eyes in order to find the source, usually high on a branch. Once in a while the vocal trills like a wolf whistle. I’ve tried to answer the way my dad did when I was a girl, but I’m not a whistler. My dad could be crusty with people and gentle with small creatures. While building the bedroom additions onto the back of our tiny farmhouse when I was a girl, he made a pet of a male cardinal. Dad and that bird whistled back and forth until it eventually flew in through the windows and perched on his finger. For three or four years afterward, my sister and I often woke up to a cardinal’s song (we thought it was the same bird), right outside our bedroom on the northwest corner of the house. Many years later, a singing fake cardinal in a cage often greeted my sister’s only son when he entered the house. After he was tragically killed at age twelve while riding his bicycle, she thought of him every time that fake bird pealed. For years now, her adult daughters, my nieces, are welcomed by cardinals wherever they live. Who knows? Angels may take the form of cardinals, simply for God to let us know He cares as He colors our world. And that purity is what I see when that familiar flash of red, especially bright against the whiteness of snow, further brightens my landscape. I decorate with cardinals at Christmas. A beloved writer friend, Delia Latham, also loves cardinals. Early this fall, she sent me a cardinal ornament. I set it aside knowing it would soon decorate the Christmas tree I set up in the TV room. The new bird didn’t stay in the box long. In October I unwrapped it and hooked it where I can see it from my easy chair. When the sun hits the ornament during the day it glows an iridescent glassy red. At night it shines silver calls to mind angel wings reflecting on my Delia and me. Even in the summertime I pull up pictures I’ve taken of cardinals flashing crimson against the snow. The vivid red birds are a constant reminder of Jesus, who gave His blood, the perfect sacrifice for me. We live in a hurtful world. Tragedy and heartache strike all of us at some point. But God in His goodness always gives us hope. Because I’m a country girl, He shows Himself to me through nature. For others, it’s the smile or laughter of a child or any numerous ways. Wherever we are physically or emotionally, He reveals Himself through ways that only speak to individual hearts. All we have to do is open our souls and listen. Thank You for placing me in the country, in a state where seasons abound. 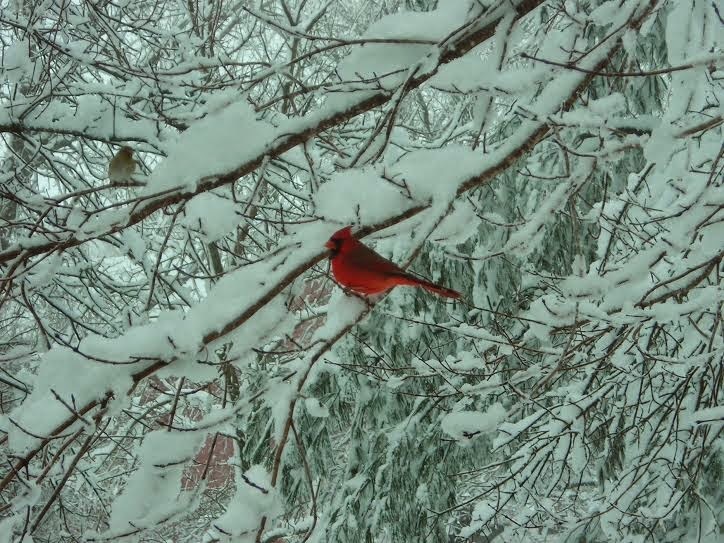 Thank You for the reminder each time I see a cardinal, especially against the snow, that though my sins be scarlet, You have washed me clean. Thank You, Jesus, for shedding your blood for me. Amen. A Nebraska country girl, LoRee Peery attempts to see God’s presence every day. Often that gift comes from nature, and she is most relaxed in the outdoors. The call of a cardinal draws her to look for the distinctive flash of crimson. A meadowlark’s melody always transports her to the farm where she grew up. A rainbow holds special significance, since one appeared the day of her father’s funeral and means the promise of the Lord’s presence in her life. She clings to I John 5:4 and prays her family sees that faith. Just 15 days before Christmas Day! Are you enjoying this holiday season? What better way to celebrate and appreciate this special time of year than to enlighten your mind through reading Scripture and holiday devotionals? 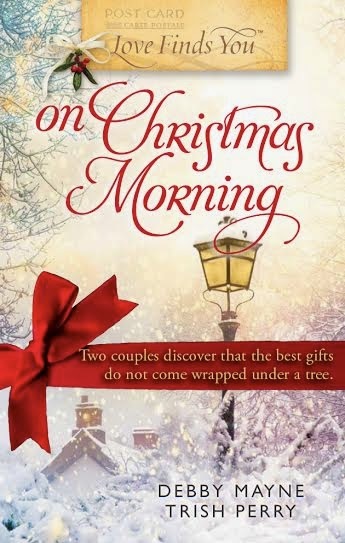 Okay, there are many wonderful ways to celebrate the Christmas season but today, I encourage you to enjoy this way which is reading a devotional written by Lillian Duncan, a Christian writer who loves God, Christmastime and writing suspense-filled romance stories. Today, Lillian will shine light on how the Light of the World (Jesus Christ) came into this world as a baby and changed everything. If you're a parent, I'm sure you can relate on a very real level because you have experienced firsthand how the birth of your first baby changed your life forever. The birth and life story of Jesus Christ is no different, only He changed more than His mother Mary's life, He changed the world. A baby changes everything, there's no arguing that point. Ask any parent, new or experienced, young or old, tired or rested. A baby changes everything for their family. And that’s even more true for the baby we celebrate during this Christmas season. Let's take a look at the reason for the season. JESUS—his birth, his life, and his death changed the world! Atheists, agnostics and some who just aren't sure often give Jesus his "due." Oh, he was a great teacher, they say, but He wasn't GOD. Let's take a practical look at that for a moment, shall we? What's the year? Oh—it's 2014 A.D.
A.D. does not mean “after death,” as a lot of people believe, but it stands for a Latin phrase: “anno domini” meaning “in the year of the Lord,” the year Jesus was born. B.C. stands for “Before Christ”, though now people have changed it in an attempt to downplay the religious aspect. Wow! Time is measured by Jesus's birth and death. I'm impressed! JESUS—His birth, His life, and His death changed the world! Let's take a look at Jesus's life for a moment and those who knew him best: his disciples. Without going into the gory details, ten of the original twelve apostles chose death rather than renounce Jesus's divinity. Why? Because they experienced life with the Messiah. Some were with him the day he was baptized and they heard God's voice come down from the heavens saying, "This is my beloved son with whom I am well pleased." They experienced the darkness the day he died. They knew beyond a shadow of doubt that Jesus was the Son of God and they were willing to die rather than renounce His divinity. Because of that certainty, they spread the good news of the gospel throughout the world. But even better, Jesus changed my world. Christianity isn't about rules and religion. It's about a relationship with God through His only begotten son, Jesus. And that has made all the difference in my world! "Whether you have already seen the first of the season's snow or are still awaiting its arrival, you'll want to curl up with a cup of cocoa as you enjoy these two sweet tales." ~Sarah, 4-star customer review on Amazon.com. If you haven't already guessed from Sarah's review on Amazon.com, today we're talking about Christmas stories! Actually, two Christmas stories in one book called Snowflake Tiara written by Angela Breidenbach and Valerie Comer. We're going to focus on Valerie's novella called More than A Tiara. Valerie will share information about the writing process, the Christmastime story setting, the characters and she will also talk about collaborating with Angela to write this book. 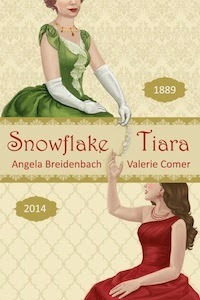 Alexis: Why is your latest release (2014) titled Snowflake Tiara, Two Christmas Romances 125 Years Apart? What type of book is it—a novel or novella or another category? 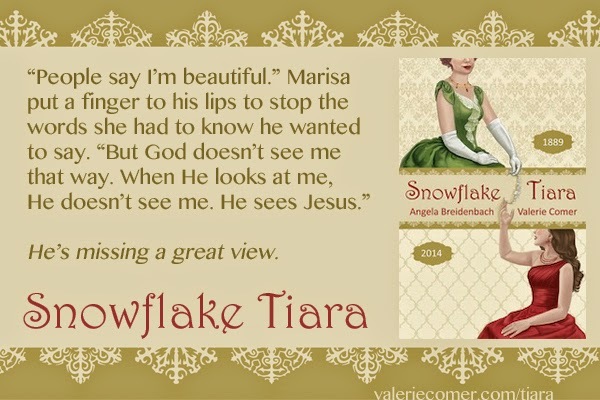 Valerie: The title is Snowflake Tiara, and the remainder is a quick description of the contents. It is a collection of two long novellas. Who is Angela Breidenbach? Did you two write this book together? Or are there two separate stories, one written by each of you, in Snowflake Tiara? I should be really good at introducing Angela by now! She visited recently and we did several events together at which she was the main speaker and I was her sidekick. She is pretty awesome, frankly! She's Mrs. Montana 2009, a sought-after speaker, and an author as well as a pageant and life coach. Can you speak for Angela and tell my readers why she wrote The Debutante Queen which is the first story in Snowflake Tiara? Angela is passionate about volunteering and believes we can make the world a better place by pitching in. She's a pageant queen herself and knows how much light pageantry can shine on worthy organizations, so the combination is a natural one for her. She set her main character, Calista, on a quest to help the children abandoned at the last stop of the Orphan Train in Helena, Montana, in 1889.
Who is your favorite character in your story? Explain why and include details on their character traits. I protest. This isn't a fair question! I like all the characters. Well, except for the one who… Never mind. Hmm. I'll go with Bren Haddock. She's a good friend of the heroine, a single mom who's been kicked in the teeth by life, but she's determined to make a better life for her two young kids. I loved her spirit and was thrilled to find I could help in her quest in some small ways. Are your leading ladies in both stories related? Is there any connection between the first story by Angela and the second story by you? If so, please explain. There's a lot of connection between the tales. My heroine, Marisa, is the triple-great granddaughter of Angela's heroine, Calista. They have a similar passion for helping children. Angie and I had a great time working back and forth while planning, writing, and editing, to tie the two stories together on numerous levels. The most obvious is that both of them compete in the Miss Snowflake Pageant in their time periods. Why did you write More Than a Tiara? What is it about and how does it tie in with Angela’s story? Explain the concept. How much time did you spend writing More Than a Tiara? How did you research for creating your holiday story world? This story is about half the length of my other books, but it took at least as long to write. I struggled with the story line, and it took me a while to figure out what the problem was. I usually interview my characters, create a few notes and ideas for a story, and jump in. More Than a Tiara required a more rigid structure because the second half (about the spot where I usually swing out into no-man's-land as a seat-of-the-pants writer) took place during the beauty pageant with defined events and expectations. Once I realized the issue, I found ways to work through and around it, but I'd been stuck at that point for several weeks. What was your favorite part of writing More Than a Tiara? The children, hands down. I mentioned Bren earlier. Her kids are 8 and 6 and were a delight to write, especially once I'd added in the hero's niece (6) and nephew (4). There is nothing like child-like wonder at winter and Christmas! Which character in More Than a Tiara do you relate to the most? Why? That's a tough one. Because Marisa has been a super model and is now competing in a pageant, I identified with her less than I usually do with my heroines. Still, I gave her some of my passions to run with, and that helped a lot. She simply had a very different angle of pursuit of our mutual passions than I do as a middle-aged wife of a farmer and beekeeper! Does Snowflake Tiara have a happy ending? Definitely. It was fun to bring it all the way around to add a bonus closure to The Debutante Queen as well in the final scenes. What do you hope your readers will take away from reading More Than a Tiara? So many things! I hope they'll see again the wonder of Christmas. I hope they'll revel in their beauty and value in God's eyes. And I hope they'll consider the value of good, healthy food every day…and how to provide that for folks less fortunate. Complete this sentence: My favorite Christmastime memory is _______________________because____________________. My favorite Christmastime memory is spending the day after Christmas at my grandmother's house every year when I was growing up because my cousins and I had so much fun together. Alexis: Thank you for the interview, Valerie! Please leave a question for my readers to answer which will qualify them to enter the book giveaway contest to win an e-book from you. Valerie: What organization embodies your passions so much that you'll spend precious time volunteering to help them meet their agendas?